This page was last updated Mon 08 April 2019. This page lists all reports that for America including those that involve other countries too. Click here for a list of reports that involve only America. From mid-March until late October of 2008 I cycled some 13,000 kilometres (8100 miles) across North America. I started from Victoria, British Columbia, slowly making my way north by bike and ferry to Anchor Point, Alaska, the most westerly point in North America reachable by continuous road from elsewhere on the continent. From Anchor Point I headed more or less south east, but not in a straight line, taking my time to explore and to visit, letting the wind and my whim dictate my route, eventually arriving at Cape Spear, Newfoundland, the most easterly place in North America. I'm cycling from California to Argentina. Thus far, the desert of Baja Mexico has taken all my expectations, pulverized them into a small jar labeled 'you wish!' and then at regular intervals, delivers a healthy dose of dust in my face. Luckily, my expectations were not that great to begin with, and have now lowered considerably, so the jar was emptied swiftly. However, I have had my fair share of 'WTF' moments. Baja, in all its glory, is deserted for a reason, mainly because the terrain is harsh and inhospitable. This makes for 'interesting' cycling, especially for someone like me who thought Baja was flat and not going to be too hot as it's the rainy season. Well, that jar of dust was opened quickly as my expected 100km leisurely descend into Ensenada, turned into a hilly, unpaved, insanely hot and dusty ride. Not one to let go of misinformation so easily, especially when it's of my own making, I continued down the coast in search of flatter and cooler surroundings. Needless to say my search was in vain, and the true Baja revealed itself, small mountain ranges dominate the land, and with afternoon highs of 120/50c, and very little opportunities for shade, I found my experience coinciding with the environment, in all it's extremity. It is a repeat tour! It seems, I felt in love with Hwy 1. Pacific Coast Hwy. San Francisco - Los Angeles. In May, the same year, I have done the same with my daughter Anne. You may find a short report on this portal. This time, I did a little detour: I stopped for a couple of days at Pismo Beach and discovered the surroundings of San Louis Obispo. I detected, the Los Osos Valley Road, the Lopez Lake, The Foxencanyon Road, Solvang the Danish city replica, the Marcos Pass road, etc. All places, I will remember well...! Enjoy the pictures! Good luck to all the followers! Again: Palm Springs is not made for bicycle riders. It is surrounded by the San Bernardino mountains in the North and the San Jacinto mountains at the South. Riding down to San Diego and Tijuana was a sort of deja-vu. San Diego's Old Town has not been so busy as time I have been there with Anne. It looks to me: California is in a sort of economic recession. Enjoy the pictures! Good luck to all the followers! To complete our Hwy 1 experience (remember, we did Seattle - San Francisco), we decided to do the Southern part. Final destination has been San Diego (I tried a bit more: Tijuana [MX]). Anne has been a very brave rider! It's was a beautiful tour. Worth to go! Recommended to have a stopover at Solvang, and further the Foxencanyon Road via the San Marcos Pass which leads you to Santa Barbara. We made it it via Lompoc and the Vandenberg airfield. Funny: we, as foreigners have passed the military complex, whilst an US citizen has been stopped... Maybe because of the reason: we had an ID, the poor US cyclist had no ID. The distance San Diego - Las Vegas we managed by a rented car. But we where back on bike in Las Vegas. Going down to the Hoover Dam, is recommended. Wonderful, real scenic landscape! If you like it or not: Las Vegas is always a place to see. Good luck to all the followers! As my managing director retired in the same year as I did, we decided to do a joined bicycle tour... We have found information in a popular booklet 'bicycling the Pacific coast'. At the Internet, we found the tour description by the publisher of this web page. Californian people are very open. Clear English, easy to understand, and still a flower people mentality... Very pleasant! Good luck to all the followers! My former managing director Raimund and me (Iris Mueck) started bicycling the Western world after our retirement. Our most desire: to pedal round the Grand Canyon (what we actually did not - as the distance is too big. With the help of a rented car, we made a lot of local trips to the parks. Starting at Los Angeles, we hit Las Vegas. If you like it or not. It is worth to see. And, if you plan a trip to Grand Canyon, there is more or less no way. A stopover should be planned. Sideway trips leaded us to the Arches park (oh wonder bicycle path ways up to the park) and to Page (Glen Canyon). From there to the Antelope Canyon, which is operated by native Americans. And further to the Monument Valley. On the way back, to complete the circle trip, we hit Bryce Canyon and the Zion park. Back to San Francisco with another side tour to the Yosemite park. As a well known book author was still alive, we tried to meet him at the campus of the Stanford University. Good luck to all the followers! The Central park: a huge bike way, which closes in a round 5 miles circle. Some bikers doing city races. Hard to follow. I have been staying for 10 days in NYC, did my daily exercise in crossing the city to the Hudson river bike path. Very recommended bicycle path. Starting at the Statue of Liberty, ending at the Harlem river mouth. Good luck to all the followers! The Big Circle: A round trip which is a little demanding. All eye catchers needs to be 'earned' by your personal power. Good luck to all the followers! San Francisco - Los Angeles - Las Vegas - Grand Canyon - Bryce Canyon - Zion Park - Death Valley - LAX. Cycling in America is; friendly people, vast landscapes, hamburgers and picnic tables by the campsite. Our favorite region to tour through is the American Southwest with its painted deserts, mountains and colorful rock formations. On our Cycling in America website we show what it's like to travel across the states (via the Adventure Cycling Transamerica trail) and through the American Southwest. Fahrrad Tour von Calgary aus in die Rocky Mountains von Kanada, durch die Nationalparks Banff und Jasper in Alberta, Hiking auf dem Berg Lake Trail beim Mount Robson und schlussendlich wieder mit dem Fahrrad über Kamloops und Whistler nach Vancouver in British Columbia. Riding the Running Bull - Bike Tour Travelogue Mexico. Biking adventure through the desert of Zacatecas and to the Pacific Ocean at Manzanillo. Biking Route: Bike from Guadalajara to the Santiago Canyon, through the desert of Zacatecas, back to Guadalajara, over Sierra Manantlan (part of the Sierra Madre Mountain Range) to the Pacific Ocean at Barra de Navidad and Manzanillo. I finished up my MBA at Wharton and decided to bike across the country before starting a life of 80 hour work weeks. I rode from Seattle to Washington, DC, alone, self-supported, creating my own route while I went, covering about 100 miles a day (3200 miles in 33 days). My blog details the logistics like where I stayed, how far I rode, and what roads I took. It also covers some of the more entertaining bits: the amazing people I met, getting lost a LOT in the west, being chased by dogs, coinciding the the Sturgis Bike Rally, my mild obsession with Wall Drug, and other daily trials. As a single woman, this whole thing made my mother very nervous, but it was a fun adventure. My name is Dave Briggs, and I am an Adventure Cyclist from England. 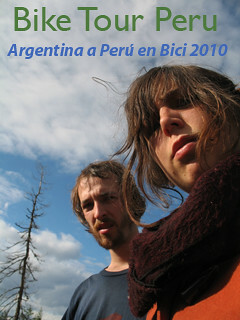 My current cycling trip, is to cycle the Pan-American route from the very north of Alaska to the south of Argentina. I began my journey in July 2009, and am estimating that I will finish sometime in October 2010. My route has taken me past sights of natural beauty, over rough tracks, near mayan ruins, and enabled me to meet hundreds of friendly people. This is not my first trip, however. I have also cycled from England to South Africa, details of which are also at my site, which covers nearly 15 years of travel around the world. Put the kettle on, make a nice cup of tea, sit down, and enjoy !! This is the story of our trip in Bicycle between the towns of Jasper and Banff in Canada. siamo un piccolo gruppo di amici che stanno pianificando di viaggiare in bicicletta da Manaus a Caracas il prossimo mese di agosto. Se qualcuno fosse interessato a partecipare sarebbe il benvenuto. This is the story of my trip from Field in British Columbia, Canada through Rogers Pass all the way to the sunny Okanagan Valley. 3rd try is a charm. Strained Achilles, Broken arm, pause. Now we're in Argentina with next to no money, setting out into the unknown. El niño may have washed out the roads in Bolivia, Macchu Picchu is closed until April. With alternate itineraries at the ready, we think we'll make it. This a description of my cycling trip across the Yukon and the Northwest Territories via the Dempster Highway a 1400km long journey. My goal for this Tour was to visit all of the major inhabited parts of the former supercontinent of Gondwana. Today, those places are mostly located in the Southern Hemisphere. Another aspect of my plan was to avoid long airplane trips by crossing oceans on container ships. That part of my Tour frequently caused problems, but I did hold fast to that idea, more or less. I traveled alone during 40 months and covered a little over 86,000 km by bike in 44 countries. My primary interest was the simple joy of cycling in new places, but I also concentrated on Natural History, Flora and Fauna, Ancient Sites and Diverse Cultures. My site contains sections describing Tour preparations, detailed logs, photos, posts written during the Tour, and a collection of essays written once it was complete. Inspired by an article in National Geographic, Gunzelmann hoped his personal adventure and real-time blogs would help bring awareness to the rainforest destruction occurring along the unfinished "TransAmazonica" highway he traveled. Though not entirely paved, the highway already connects Brazil and Peru from coast to coast. In a journey filled with vivid stories of swarming ants, scorching heat, violent political riots, poachers, a river crossing in the bucket of a bulldozer, and a daring escape from a cougar on top of a speeding fuel truck, Gunzelmann would have never guessed what would be the most dangerous thing of all he would encounter—that the very people he blamed for the destruction of the Amazon were often also the people who would also help him the most. For the last many summers, we have visited the islands of the Eastern Atlantic seabord: Lofoten in Norway, the Outer Hebrides, Orkney and Shetland in Scotland, Ireland, Wales which is not an island, but might as well be one, and Gotland in Sweden which is an island, but in the Baltic, not in the Atlantic. The time had now come, we thought, to cross the Atlantic and see what it looks like on the other side. As islands seem to be our preferred locations, we chose Prince Edward Island (PEI in the local vocabulary) in Canada which has the advantage of being fairly small and not too hilly. A three week solo and unsupported ride from Vancouver, Canada to Tijuana, Mexico. I followed the Pacific Coast most of the way south using the American Cycling Association maps. We're cycling 25 000 km across the Americas from Alaska to Argentina to raise funds for Cyclo Nord Sud, a non-profit that sends used bicycles to developing countries. As ambassadors for this organization, we will meet with Cyclo Nord Sud's Latin American partners and hopefully create contacts with new ones along the way. We're a francophone/anglophone couple from Montreal, Quebec, Canada. We're each adding original content in our respective languages, so our blog is a 2 for 1. Enjoy! Nous traversons les Amériques dans un voyage autonome de 25000km en vélo, de l'Alaska à l'Argentine afin de ramasser des fonds pour Cyclo Nord-Sud, une organisation à but non-lucrative qui envoie des vélos usagés dans les pays en voie de développement. En tant qu'ambassadeur, nous visiterons leurs partenaires en Amérique latine et créerons de nouveaux contacts. The lack of traffic brings wildlife closer to the road. He sees two cranes, some kind of partridge with a crest on its head, a fox and a strange black creature the size of a big cat with long fat tail (a wolverine maybe?). There is also a bird who sings refrain 'We all live in a yellow submarine'. This becomes a hit for the rest of the tour, especially the beginning 'In the toooown, where I was boooorn, lived a maaaaan, who sailed the seeeeeas', as this is all Mr. Iik can remember from the song. In May 2007 I've started a round-the-world bicycle tour. This is the first part of this journey which began in Prudhoe Bay, Alaska going south through Canada, USA, Mexico and Central America. After one year my wheels were in Colombia to begin riding around South America (Venezuela, Ecuador, Peru, Bolivia, Chile, Argentina) in order to reached Ushuaia at the end of the world in Tierra del Fuego by end of 2009. I left home in September 2004. I was supposed to cycle to Tibet in 7-8 months. 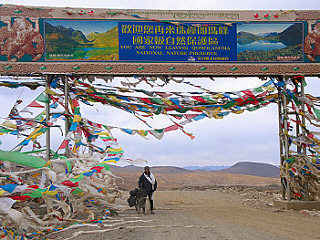 Until now, I never reached Tibet and I'm still on the road. A cold winter in Turkey make me change my itinery and then my travel's philosophy. I decided that the performance was not that important but the road itself brings me everything. In almost a total of 2 years where I worked as a safari tour guide in Namibia, I had enough money to continue and live the dream further and further. Soon, I will attempt to buy a boat in Amazonia and turn it into a bicyle-boat to cross the Amazonas on its bigest highways: the rivers! This tour is still in process and I will keep it updated on my website. nature, dirt roads, cultures and wildlife lover..
World Biking: The web's most comprehensive Africa Cycling Expedition. Eric and Amaya pedalled 55,000 kilometers and traversed 55 countries (37 in Africa) when they cycled from France to Cape Town via West Africa and then back to France via East Africa and the Middle East between 2006 and 2009. The next stage of their expedition beginning in June 2009 will take them across the USA and then through South America all the way to its southernmost tip, Ushuaia. Lots of photos, tales of their adventure plus touring tips, practical information and gear reviews. A lonely Hungarian cyclist who has the Summers free and likes to make new advantures on his bike. Started with his short Croatian tours, but made it always longer, and in 2005 didn't stop before the 2700th kilometer in Greece. In the following year he decided to start the real adventure, to cycle out of Europe. 2007 was the year of cycling across Canada, the headwindy way - of course :) After this 9000km trip now he is in the planning stage of the South-American tour for 2009. Two months of cycling from Portland, OR to Whitehorse, Yukon in four segments. 1) Solo- Portland, OR to Seattle WA via the Pacific Coast. 2) Solo- Victoria, BC to Cortes Islands, BC to Vancouver, BC. 3) with Nick C. and Stacy: Vancouver, BC to Port Hardy, BC via the Sunshine Coast. 4) with Nick P. Prince Rupert, BC to Whitehorse, Yukon via the Cassiar Highway. The first three segments were very civilized with camping in state/provincial parks and beautiful summer weather (except the occasional rain storm). The final segment was 12 days of intense cycling (100+km per day), rustic camping, many, many bears, but some of the most beautiful scenery I've ever cycled. Website has journal entries, pictures, and maps. 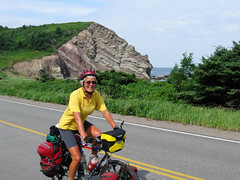 In the spring and summer of 2008 my husband Mike and I cycled 9450 km across Canada from Victoria BC to St. John's NL. We were joined for almost all of this trip by our friend and long time cycling companion Mark. I took a small computer and we were able to keep a blog for the entire trip. Our website is full of stories, detailed maps, pictures, and links. I hope you find it interesting. All in all, we had a fantastic trip through a country full of stunning landscapes and wonderful, warm, welcoming people. A ride across Canada is truly one of the world's great bicycle adventures. I highly recommended it! recorri todo Argentina y Chile, y mucho del alrededor, 30.000km. escribi una guia en espanol, con el estado de las rutas y el paisaje, y km. proximo viaje Bolivia. tambien puse fotos y lazos j'ai parcouru aussi l'Est du Canada, 6.000 km et la Belgique 1.300km et j'ai ecrit un guide en francais pour parcourir ces 2 pays en velo. il y aussi les fotos et des liens. Osmosno is David Walker and Sebastian Wevers. We have been living on the road for around ten years during which time we have covered 50,000KM by motorcycle and three times that by bicycle through the Middle East, Asia, and North and South America. Our passion is Asia where we spend most of our time, especially China and the Himalayas, but now for the second time we are visiting South America. Our journey begins in the north of Colombia and will continue south tracking the Andes until we stop. This blog will tell the story of our journey. Ruth und ich (Horst) fuhren mit dem Fahrrad von Inuvik, nördlichster im Sommer anzufahrender Punkt in Nordwestkanada bis zum südlichsten anzufahrenden Punkt im argentinischen Feuerland, Ushuaia. Wir waren 22 Monate unterwegs, legten 29'100 Kilometer mit dem Rad zurück, fuhren 280'000 Meter in die Höhe, obwohl wir durchschnittlich genau nur jeden 2. Tag im Sattel sassen. Das nur für die Statistiker, Weiteres auf unserer Website. A trip from Calgary to Denver. This summer I had the chance to ride a (big) part of the `Great Divide Mountain Bike Route'. An itinerary suggested by Adventure Cycling Association (Sections 1, 2 and 3). This road goes to the United States from the North to the South follows the Continental Divide and takes more than 80% of gravel and dirt road. We are entering our fourth year on our tandem adventure 'round the world'. We have visited Mexico, Central & South America, New Zeland, Australia, South East Asia, China, and Europe. We are now wintering over on the Costa Del Sol, Spain. Off to Morocco in Feb. 09 then back into Europe for 09. My name is Ally Katch, and in the summer of 2009 I will ride 4000 miles across North America to raise money and awareness for affordable housing. I, along with 33 other men and women, will need to raise $4000 for the affordable housing cause. Then, in June, we will set off from Portsmouth, New Hampshire, USA for the summer of a lifetime with an organization called Bike and Build. Over the course of about 10 weeks, we will bicycle 4000 miles and spend several days at affordable housing build sites with such organizations as Habitat for Humanity to help construct housing for people in need. You can learn more about my ride at my website, , or you can track our progress (starting 18 June, 2009) on my blog at .